Follow the path of those who took this legendary Jules Verne trip around the world. Do it less than 80 days and faster than your opponents and win the game. Win or lose, all will enjoy this game as you travel by train, boat, elephant, and balloon around the world. The game has just the right mix of strategy, luck, interaction. I'd rate the strategy a 3 or 4 out of 5, add in a 1 or 2 for luck to make it a bit more interesting and a 2 for interaction. The goal is to make it around the world as fast as you can, yet efficiently. You may be the first to make it, but did you spend too much? The game is very easy to learn and plays in about one hour. The most innovative about this game is the way the players can use different amounts of time, which makes it difficult to assess who is ahead (which is a good thing). It implements the theme very well and is a very enjoyable race game. 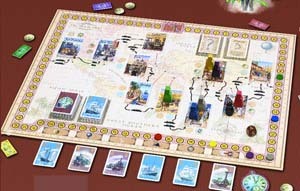 Around the World in 80 Days is a race game based on the famous novel. What is great about it, is the way the game handles various actions taking different amounts of time - you might get ahead on the board, but if you use more days doing it, you can still end up in last place. This quite innovative mechanic helps to keep the game tense and exciting until the end.